Do we have to buy our lot from you to use you as a builder? No, we have a stock of lots in developments we are currently building in but you can purchase your own lot. We can work with you in other building developments as well. How long will it take to build a home with Cherry Ridge? It depends upon a few different factors. The floor plan selected the pace that decisions are made, and the size of the home. Stock floor plans that we offer typically take 4 -5 months to complete. What is the base amenities included in a standard spec home? We already have our own floor plan. Do we have to use one of your floor plans? If you have your own floor plan, we can work with it. We can also work with you and the architect or draftsman to customize one of our floor plans. How do we get started building or remodeling with you? As a general policy, we require that you sign a letter of agreement confirming that you plan on building or remodeling with us. At that time we will also require a fully applicable, but non refundable $5,000.00 deposit, which will be taken out of the overall contracted price of the project. Why do you require such a large deposit? We require the $5,000.00 deposit because we want both the client and Cherry Ridge to get serious about the construction plans in order to move forward. The deposit will be allocated towards architectural drawings, plans, designing, bidding the job to subs, and time spent with the client during the first initial stages of construction. Keep in mind that about half of the construction process is preliminary planning and designing, all of which occurs before physical construction even begins. We feel that the deposit protects both the homeowner and Cherry Ridge. Do you offer home improvement services? Yes, however at Cherry Ridge our primary client are those interested in building new homes, commercial tenant finishes, or medium to large remodels. Our rate is $85/hour for home improvement projects and we require a three hour minimum. 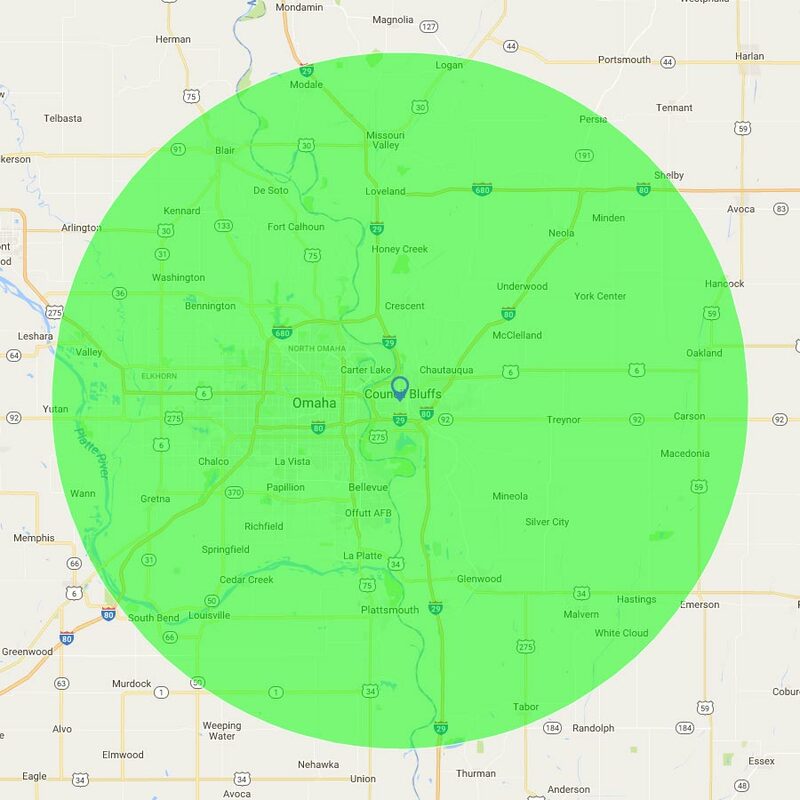 Cherry Ridge Construction provides construction services throughout Council Bluffs, Omaha and surrounding communities, generally within 30 miles of our shop in Council Bluffs. This includes the Iowa communities of: Glenwood, Oakland, Treynor, Carter Lake, Missouri Valley, Crescent, Malvern. And the Nebraska communities of: Plattsmouth, Bellevue, Papillion, La Vista, Springfield, Elkhorn, Gretna, Bennington.